Ants are often less harmful for plants in the garden, but they have a habit that makes them dangerous for gardens. 1. Ants have a very interesting job in the insect world: they are farmers! 2. Specifically, ants protect the aphids colonies and they even carry them on other plants, establishing other colonies. 3. A colony of aphids protected by ants can no longer be attacked by predators. 4. For example, ladybugs, the greatest enemies of aphids, will be banished or killed by ants. 5. The reward for their services consists in sweet substances excreted by aphids. Baking powder. Put 6 tablespoons of powdered sugar mixed with baking powder in a jar. Perforate the lid with a nail and place the jar around the anthill. The ants will carry the sugar inside the anthill, but the ingesting of the baking powder will be fatal for them. Frequent watering. If you frequently flood the anthill, you will determine them to change their home. Watch their migration and direct them outside the greenhouse, solarium or garden. Soap based insecticide. 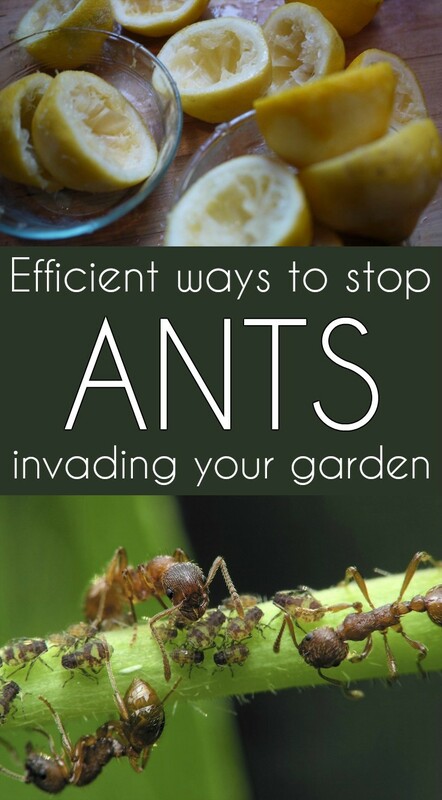 Spray the ants nest and routes with this solution. Moldy lemon. Place moldy lemons on the ants route. Black pepper. Ants will leave voluntarily if you sprinkle freshly ground black pepper on their routes. Boiled water. When nothing else works, pour boiling water repeatedly inside the anthill until the colony dies. Mineral oil. Pour mineral oil inside the nests. After the disappearance of ants, it is better to remove the oil soaked ground with a shovel. Quicklime. Place a few pieces of quicklime near the anthill entrance and pour cold water. Handle the quicklime carefully using gloves! Gasoline. Place a sponge soaked in gasoline over the anthill entrance and place a bucket upside down over the sponge. The ants will quickly suffocate.